Screenplay: Matt Reeves, John Ajvide Lindqvist. Starring: Kodi Smit-McPhee, Chloe Grace Moretz, Richard Jenkins, Elias Koteas, Cara Buono, Sasha Barrese. The ink had barely dried on the film-critics’ acclamations of the Swedish horror film “Let the Right One In” in 1998 before Hollywood had stepped in for their take on the novel by John Ajvide Lindqvist. Remakes are not normally a good idea but “Cloverfield” director Matt Reeves makes a surprising exception to that rule. Owen (Kodi Smit-Mcphee) is a lonely boy, who’s living with his mother in an apartment complex in snowy Los Alamos, New Mexico. His parents have separated, and his unhappiness is magnified by the fact that he’s been targeted by a school bully. One night, in the courtyard outside his apartment, he meets his new neighbour Abby (Chloe Moretz), a sullen, mysterious 12-year-old girl who tells him she can’t be his friend. Before long she goes back on her word because it turns out that she’s lonely, too. The big difference is that she’s a vampire who needs fresh blood to survive. Those who have seen the original may think this version unnecessary. It certainly sticks very closely to its predecessor; from the lonely isolated setting, to the gloomy, eerie atmostphere and strikingly powerful and horrific images. Surprisingly for a remake though, it has ironed out the creases the original seemed to suffer from. 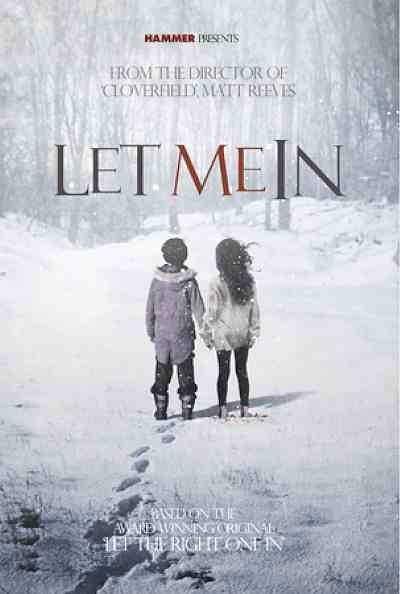 I’d have to have a reappraisal of “Let the Right One In” but my first impression was that, although beautifully crafted it was quite lethargic. This time, Reeves cranks up the pace – without rushing it – and cranks up the gore – without being gratuitous. The CGI effects may be a little overused for some tastes but I found that they worked well. The two young leads deliver sensitive, believable performances, with the ever reliable but underused Elias Koteas and especially Richard Jenkins, lending good support. The only problem with the film is, having already seen the original, you know what’s coming next and it lessons the impact. Otherwise, it’s a fantastic and deliberately paced horror/love story. A good remake should always add to what went before and this certainly does that. An excellent example of how it should be done. If you’ve not seen the original then you’re in for even more of a treat. Bravo, Mr. Reeves, you’ve silenced many naysayers, myself included. This entry was posted on January 10, 2012 at 2:15 pm and is filed under Horror with tags 2010. You can follow any responses to this entry through the RSS 2.0 feed. You can leave a response, or trackback from your own site. Excellent – I did a comparison of the two if you ever feel like checking it out. I was SOOOOOOOOOO upset the cloverfield guy was going to do a remake but he really delivered! I’ll swing by and have a look. I liked them both and I totally agree, Matt Reeves done a sterling done on thi remake. I wasn’t expecting it to be as good as it was. I really like both versions – a lot. I watch them both periodically. I enjoyed the book too.